I wrote a Tvheadend plugin for Emby. Unzip the attached dll and put it into the Plugins folder of your server. In the configurations dialog you must set at least the servername, user and password for your tvheadend server. If you changed the default ports adapt it to your values. I implemented the plugin with my "old" tvheadend server version 3.4.27. This version don't support series timers so all code for this is not tested. Please report found issues here. Edited by Tolotos, 08 April 2015 - 01:55 AM. Did you've implemented the HTSP protocol? Since it's more robust by using TCP it should be prefered over traditional Streaming protocols. The communication between Emby and Tvheadend is HTSP streaming is over HTTP. Streaming over HTSP should be possible but needs much more knowledge and time. This works great, thanks for bringing it to us. The only thing I noticed so far was that it did not allow blank username and password (yes I know it's bad) to be entered. I had to create a username and password on tvheadend to get around it. Other than that it really is great work, well done! I have the plugin setup and it's connected. It has downloaded channel icons but that's pretty much it. I'm seeing about 15-20 sec wait to start a channel. also, stream is not stopped when I close playback. FFMPEG is still transcoding and tvheadend is streaming. looking at the log, it seems it was able to read EPG, because emby server log has a lot of hits to http://api.themoviedb.org for epg items. Edited by KRA, 08 April 2015 - 02:25 PM. 2015-04-09 07:56:54.0959 Error - App: Error streaming media. The client has most likely disconnected or transcoding has failed. Cool - I'm ready to leave NPVR to TVHeadend that I allready use for Kodi. KRA and puithove can you please check the attached version. I double check the tvheadend documentation and can't find an wrong cast. The new version now catches the exception, logs the name of the wrong field and skip settings the value. The connection is unfortunately not close able. I give the URL to Emby and lost control. A close method is called than from Emby but tvheadend has no method to close this http stream. as for the stream not closing I guess there's a bug in emby then, not killing ffmpeg when I close playback, because tvheadend should kill stream when ffmpeg is dead. It also reads my schedules now, but nothing is displayed when I click recordings. Edited by KRA, 09 April 2015 - 03:11 PM. Edited by zozotv, 09 April 2015 - 03:17 PM. @KRA I have no idea what the second stack trace causes. All accesses are surrounded by a try / catch block. Can you please check the attached version? Did you put both files from the zip into the plugin folder? The *.pdb should give more detailed information about the error location. I changed the access to the autorecId field to string. Great stuff, I'm now getting recordings listing and I also got a icon indicating series recording in the schedules that I don't think was there before. playback of recordings work great but I do get a "session not found" error printed onscreen when it starts playback. Also live-tv is much faster to start playback, very nice. 2015-04-09 19:36:59.7013 Error - HttpServer: Error in SharpWebSocket: An exception has occurred while receiving a message. 2015-04-09 19:38:36.0620 Info - App: /config/ffmpeg/20150331/ffmpeg -fflags +genpts -i "http://192.168.10.205:9981/dvrfile/1530796060?ticket=095CBD8F3B272FBC9BBCB4A16886B8C0D1070B0C" -sn -codec:v:0 libvpx -force_key_frames expr:gte(t,n_forced*5) -vf "scale=min(iw\,1920):trunc(ow/dar/2)*2" -pix_fmt yuv420p -speed 16 -quality good -profile:v 0 -slices 8 -crf 10 -qmin 0 -qmax 50 -maxrate:v 29872000 -bufsize:v (29872000*2) -b:v 29872000 -vsync vfr -map_metadata -1 -threads 3 -codec:a:0 libvorbis -ab 128000 -af "aresample=async=1" -y "/config/transcoding-temp/9e094abfdd63d6d098f7ec0867e3b37b.webm"
2015-04-09 19:38:37.6527 Error - HttpServer: Error in SharpWebSocket: An exception has occurred while receiving a message. 2015-04-09 19:38:45.6989 Error - App: Error streaming media. The client has most likely disconnected or transcoding has failed. 2015-04-09 19:38:51.1174 Info - App: /config/ffmpeg/20150331/ffmpeg -fflags +genpts -i "http://192.168.10.205:9981/dvrfile/1259080598?ticket=E1668ABDCB4B95969497E1F8167B7C43D6076C63" -sn -codec:v:0 libvpx -force_key_frames expr:gte(t,n_forced*5) -vf "scale=min(iw\,1920):trunc(ow/dar/2)*2" -pix_fmt yuv420p -speed 16 -quality good -profile:v 0 -slices 8 -crf 10 -qmin 0 -qmax 50 -maxrate:v 29872000 -bufsize:v (29872000*2) -b:v 29872000 -vsync vfr -map_metadata -1 -threads 3 -codec:a:0 libvorbis -ab 128000 -af "aresample=async=1" -y "/config/transcoding-temp/a04f76b6c06ff6a30dd65019835c19ea.webm"
2015-04-09 19:38:52.5966 Error - HttpServer: Error in SharpWebSocket: An exception has occurred while receiving a message. 2015-04-09 19:39:08.3083 Error - App: Error streaming media. The client has most likely disconnected or transcoding has failed. Also I've noticed when I set a recording it is added with default DVR profile, and it is given "important" as priority. I guess that is ok as default values, but it would be great to have an option there. I don't know what the emby api gives you to work with in that regard. I hope you continue work on this plugin, I'm really impressed by how well it works in current state, I think it already should be included as a built in option in emby with it's current state. 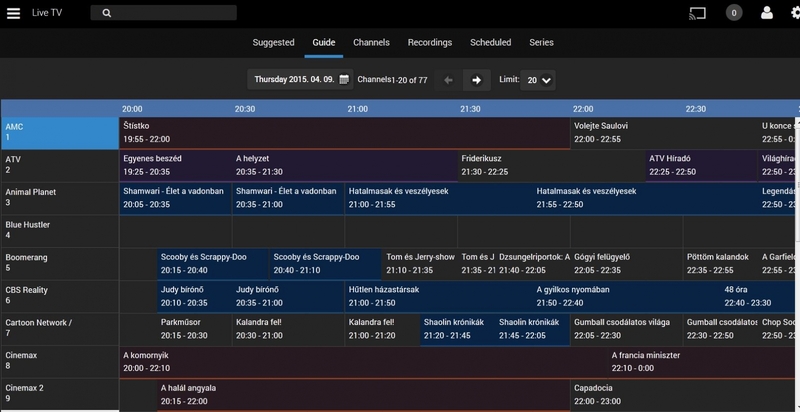 And I hope someone gets time to revamp the epg view in emby web soon, I guess it's ok, but the missing items bug is a little nasty. This URL is given to Emby and I have no further control. The EPG bug blocks me one week searching in my code a reason for the missing entries. Just wanted to let you know since you cannot test it. Very cool, using that most recent version posted, things are working. Guide data is filled in, playback works fine. I am seeing quite a few errors in the log, but it doesn't seem to be affecting functionality as far as I can tell. Invalid URI: The URI scheme is not valid.